I am sitting on a little bamboo deck overlooking the Andaman Sea. The sun went down just about an hour ago, and now the stars are coming out. There is a warm breeze blowing my hair all around and sound of the gentle push and pull of the waves just below me is like a gift from heaven. This is one of the most incredible places I have ever been in my life. And here I sit, alone. Its a strange thing being in this magical, tropical world without a companion. To think, it was just a few weeks ago that I was waxing eloquent about solitude and how I couldn't wait to be alone. In the few short hours since I've been here, I've gone fromone extreme to the next... desperately lonely... profoundly peaceful... excited... terrified... intrigued... overwhelmingly awed... and soul shakingly sad. Yea, I'm all over the map, haha. 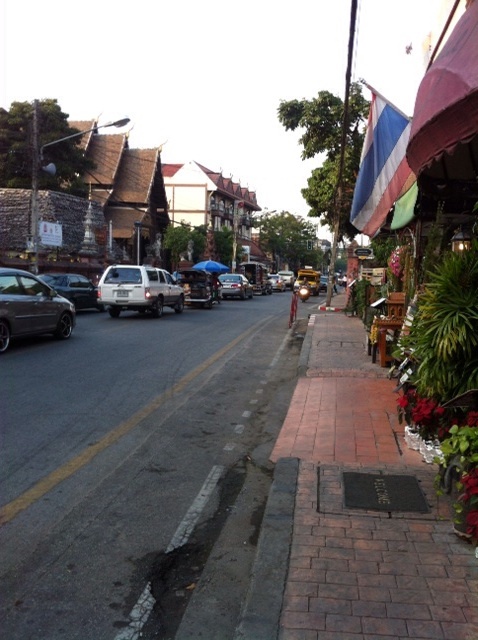 Here are some photos from my last week in Chiangmai... I spent the week recovering from the epic food poisoning incident. I wandered the streets... I danced my brains out Sweet Release style (love you Marinda!)... I drove to the top of Doi Suthep and meditated in the temple up there... I spent some more time with the amazing elephants at the Elephant Nature Park... I drank lots of delicious tea... I played music with new friends... I played with an adorable Dutch baby named Fritz... I discovered the most delicious homemade bagel ever at a little cafe called The Birds Nest... I got completely lost... I had my palms read by an incredible man named Dennis... Another magnificent week in Northern Thailand. So back to the real deal here... the blessing this week of course had me thinking about my breakup this year. Its been almost 11 months (wow nearly an entire year)... Though I can really see and feel how I have healed and grown since March, particularly since starting on this crazy journey, I have to admit that there are days when I feel a bit lost. Its a different sensation than what I have been feeling - its not sadness, fear, desperation, or anger - instead, there is this profound nothingness. I miss him, yes. I feel his absence. But there is a nothingness that comes along with those feelings. I suppose they're more of sensations, rather than emotions. My body is aware of the sensation of missing him... my heart notices the space he used to occupy... At least I think thats whats going on. I don't really know. To be honest, its quite confusing. While sometimes the nothingness is a real relief, its is quite often rather frightening. I am someone who feels things pretty hugely. My emotions tend to be big. So to feel nothing is unknown territory for me. Though I am certainly not miserable (not even close! ), I am also aware that the happiness and joy I am experiencing on this trip is very different to the joy of being in love. I feel so blessed to be on the journey that I am on - the places I've seen, things I've done and people I've met in just the 3 short weeks of my traveling have been truly incredible. For the vast majority of those 21 days, I have felt whole in my solitude. But this week, I think because of the blessing, I've found my ex showing up in my mind more often. But again, I can't stress enouogh the nothingness of that... he just shows up. He's just there, in my head or in my body or wherever. I read something this week about a couple that re-learned how to ask each other questions. Rather than asking "how are you?" or "how was your day?" they asked "was there a time when you felt confident today?" or "how have I made you feel loved today?" or "how does your body feel?" --- I love this. And I think it ties in beautifully with the blessing. Once, while we were sitting in our kitchen eating dinner, my ex asked me to stop asking him the generic "how was your day?" question. I remember feeling a little hurt by this request - I asked the question because I genuinely wanted to know the answer. Though the words were generic, the sentiment was true. But for him, it felt like a forced routine and I think it just really bothered him. So I stopped. For a few days I didn't ask him anything for fear of falling back into that routine and seeming disingenuine. But because my desire to know about his days didn't go anywhere, I figured out how to ask the right questions - ones with substance, where the truth of my love for him and his experiences was evident. That memory came to me a few times this week. "I look forward to the day when I fall in love again. I hope its big love. The kind that makes my soul vibrate."